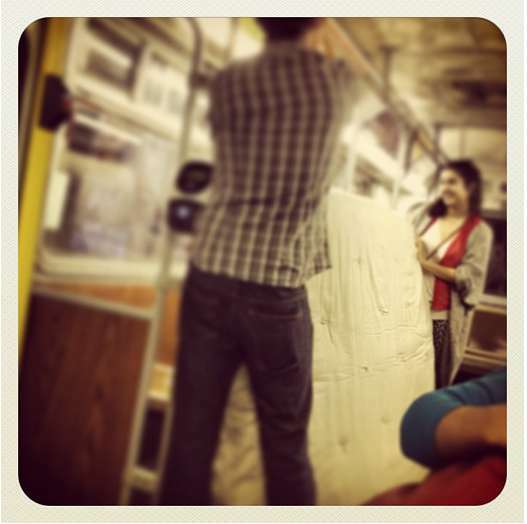 Friend of Muni Diaries Faern saw this nice young couple carting yet more strange Muni cargo—a mattress that looks like it came straight out of someone’s bedroom, with the mattress pad and everything. I mean, it’s no stranger than a giraffe leg or blow up doll, both witnessed by riders like you, and documented in our treasure chest of Strange Cargo on Muni. Weirdness on your commute today? We’re all ears @munidiaries!